Dry, sensitive or fragile skin is not natural, rather these are symptoms that something is wrong and can be caused by many factors. Unlike traditional skin care companies, Nancy K Brown does not have products exclusively designated for dry, sensitive or fragile skin, since such products only give temporary relief, camouflage the reasons and do not go after the underlying causes. Instead, Nancy K Brown has a regimen of products to address and take care of the underlying causes, so that skin can be re-educated and returned to what it should be, naturally ! Skin is not sufficiently hydrated, causing the depletion of the skin’s internal hydration reservoir, which is unable to replenish itself. Internal skin hydration is necessary for proper circulation (delivering of nutrients and removal of toxins), metabolism (use of nutrients) and healthy new tissue growth (cell turn over). use of products containing stripping agents, disinfectants, alcohol, anti-bacterial agents, fragrances, coloring agents or a combination thereof. use of antibiotics, medications, oral contraceptives, hormone therapy may cause skin dryness and sensitivity. 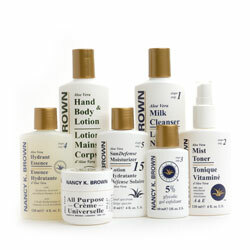 Skin care regimen with products that are easily absorbed and bring hydration and nutrients into the skin. These will assist in replenishing the skin’s hydration reservoir, thus help to promote proper circulation and nutrient delivery. This will in turn assist in normalized skin metabolism, thus reducing redness, sensitivity and dryness, returning the skin to a more natural or normal state. This combination of basic starter products to assist Sensitive / Dry or Fragile skins is available in the Try-Me / Travel Pack or the Full Size Product Pack. As your skin's situation improves, you can modify / upgrade the products you use to the Normal Skin Care regimen.